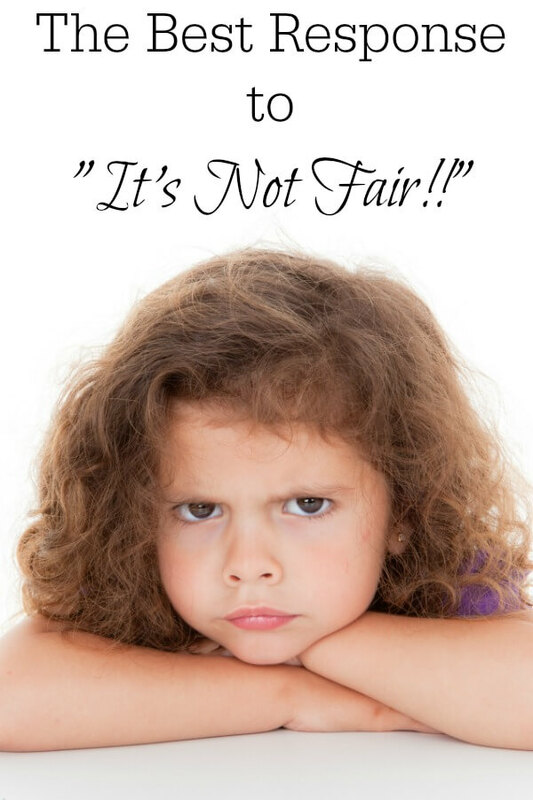 The Perfect Response to "It's Not Fair!" After I told my boys that we were leaving in 5, I asked my younger son to come downstairs and put on his shoes, I took a quick moment to straighten up the kitchen in a short-lived silent bliss. From upstairs, “Why does he get to have extra time playing? ” pierced the silence. Mom-meeeee! (Drawn out for extra drama.) It’s not fair!!! You never give me extra time! So he has to come down right now just like me. Or it’s not fair! The entire lovely message was delivered in one ear splitting whinny, squeaky, high-pitched shriek of a voice. But it doesn’t end there. Now it’s my older son’s turn. He chimes in from the playroom. It is too fair! You always get more time with mommy when she reads you bedtime stories. Last night, you got more dessert than me! AND last weekend, you stayed on the playground when I had already gotten in the car! So I get to stay and play. It is too fair! How many times have you heard the rallying cry “It’s not fair!! !” I always want to repeat my mother’s typical response: “Life isn’t fair.” In my head, I always responded: “So? You aren’t the world and you should be fair anyway.” Logic just didn’t work on me. Nevertheless, I tried her response on my boys once or twice. It was significantly less satisfying than I hoped it would be. And it wasn’t satisfying for one main reason. What if my son was right? What if I was unfair? Children believe that fair and equal are the same, which we know isn’t true. So, in my children’s eyes, if I am not giving them EXACTLY the same thing, I’m being unfair. So I take a three step approach. My first step is to try to show them that everything shouldn’t be equal. You’ll go to bed at the same time as your little sister, even if your favorite team goes into overtime on a Friday night. You’ll take ballet, karate, and piano (in addition to playing baseball), because your siblings all do these things. Want a dog? Tough luck. Your older sister has a cat and now you’re going to get one too. Older kids can stay up later than younger ones, since young kids need more sleep. Your sister gets new skis because she’s joined the ski club, while you get a new camera because you’ve joined the school newspaper. And finally, if all rational thought fails in the moment, and they refuse to believe that things needn’t be equal to be fair – I explain to them that I am fair because I actually do give them exactly the same. I confess. I delight in the confused looks that appear on their faces at this point. But it’s my little trick. I explain that they get exactly the same love from me. And I think this is actually what children are uneasy about when they complain that something isn’t fair. They equate whatever is being “given” with love. In short, they are afraid that they are loved less if their cookie has fewer chocolate chips. I explain that giving my love equally means that I give them each everything they need when they need it. What they need may be different at any given time, but they always have what they need when they need it. If one needs shoes, he gets shoes. If one needs a little more time transitioning to a new activity, he gets a couple extra minutes in the playroom while the little one gets ready. If the other needs quiet time, he gets quiet time. Here’s a sweet video with author Sonny Varela reading his book Fair is Fair that I think does a great job capturing similar ideas about equality and fairness! -let your kids listen along! Son: You always get time when mommy reads you stories at bedtime! Me: Ummmm…well, yeah. He can’t read. And, since you’re older and you can read, don’t you enjoy getting a few extra minutes under your covers with your book and flashlight? Son: Last night, you got more dessert than me! Me: Again, yes. You already had a cupcake at a school birthday party. Aren’t you lucky that you got a party at school today when your brother didn’t? Son: AND last weekend, you stayed on the playground when I had already gotten in the car! Me: Yep! And who got to hear my lecture about coming when he’s asked? You? I think not.